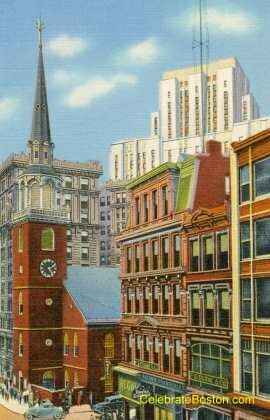 "The Old South is the most famous meeting house in Boston, by reasons of its historical associations. The Old South Society was organized in 1669, and the original meeting house was built soon after. In 1729 the first meeting house was taken down, and the present brick structure was built on the same spot. 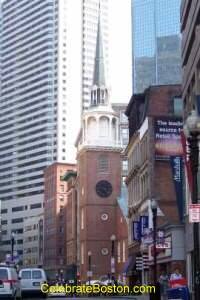 The events associated with the Old South Meeting House make it precious to Boston and its citizens. In March 1770, after the Boston Massacre, a large group of citizens waited here while Samuel Adams went back and forth to the Old State House, until Governor Hutchinson yielded to the request to remove the British troops to Castle William (where Fort Independence in South Boston now stands). Several meetings took place at Old South just before the Boston Tea Party. On November 27, 1773, a meeting of 5,000 citizens took place and it was resolved that the tea should not be landed. A few weeks later, on December 16th, another meeting of 7,000 was held. That night, a party of citizens disguised as Native Americans rushed to the ships lying at Griffin's Wharf, and threw the tea overboard in protest of the Tea Tax. Joseph Warren, three months before he was killed at Bunker Hill in 1775, delivered an oration commemorating the Boston Massacre. The aisles of the Old South Meeting House were full, and even the pulpit steps were filled by British Officers and soldiers. Late in 1775, the church was used as a rifling school by British troops until their evacuation. In 1776, after arriving at Boston, George Washington paused at the Old South Meeting House to take notice of the vandalism by the British troops.